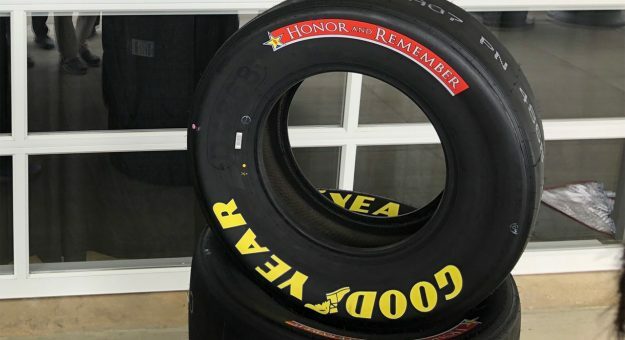 RICHMOND, Va. – Since 2010, for one weekend per NASCAR season, Goodyear has changed the branding on the sidewall of its racing tires in a show of support for the United States military and fallen heroes. This being the 10th year of that program, the official tire supplier to NASCAR’s top three series will work with a new organization and replace the standard “Eagle” with “Honor and Remember” for the Monster Energy NASCAR Cup and NASCAR Xfinity Series races at Charlotte Motor Speedway on May 23-26. Honor and Remember is a national organization based out of Virginia that has a mission to “perpetually recognize the sacrifice of America’s military fallen service members and their families,” according to its website. The organization recognizes fallen military personnel from all wars or conflicts, and with those from all branches of service. They do so primarily by dedicating the specially designed Honor and Remember flag, which is intended to fly continuously as a tangible and visible reminder to all Americans of the lives lost in defense of our national freedoms. Goodyear chose to work with Honor and Remember because of the quality of the organization, its strong mission and its history of being a part of the NASCAR community. Over the past decade, Honor and Remember has become a big part of the overall “NASCAR Salutes” program that includes supplying flags for teams to fly on their transporters throughout race weekend and helping provide names of fallen soldiers that have appeared on the windshields of NASCAR Monster Energy Cup cars during Memorial Day weekend. “Goodyear has always heavily supported the various branches of the military,” said Stu Grant, Goodyear General Manager of Worldwide Racing. At the product level we supply tires for many of the military ground vehicles, and we also provide “aircraft tires for many of the military aircraft used around the world. In addition, we offer consumer tire discount programs to military base personnel, and have a corporate supported initiative to hire veterans. “A number of years ago we decided to show our support by modifying the sidewall of our NASCAR tires for the Memorial Day weekend Monster Energy Cup event at Charlotte Motor Speedway. We kept the word ‘Goodyear,’ but replaced the word ‘Eagle’ with the words ‘Support our Troops.’ While it’s certainly appropriate to support our active military and their families, it’s also important to remember the fallen. After discussions with George Lutz (founder of Honor and Remember), we’ve decided to honor the fallen and their families, and put the ‘Honor and Remember’ organization on the sidewall of our NASCAR tires this year at Charlotte. It’s our way of calling attention to the celebration of lives lost, and showing our appreciation to the families with a positive message of thanks.